Bank Indonesia - BI is the central bank of the Republic of Indonesia. BI is a state-agency which was formed by the Government of Indonesia with main objective to achieve and to maintain the stability of the Indonesian currency Rupiah (IDR/Rp). BI was formed by the Government of Indonesia on 1 July 1953 as a nationalization results of a Dutch bank dating from colonial time named De Javasche Bank (The Java Bank). Based in Jakarta, BI now has 37 domestic branch offices spread across Indonesia and 4 overseas representative offices. BI's overseas representative offices are located at Tokyo Japan, Singapore, London UK, and New York USA. According to BI's profile as cited by JobsCDC.com, BI is led by the Board of Governors, comprising the Governor, a senior deputy governor and at least four and not more than seven deputy governors. 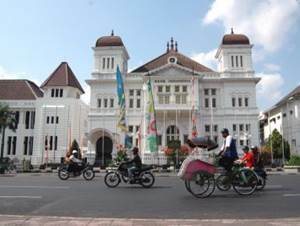 The Governor and senior deputy governor of BI are nominated and appointed by the President of Republic of Indonesia with approval from the People's Representative Council (Dewan Perwakilan Rakyat/DPR). Since 23 May 2013, BI was lead by Agus Martowardojo as the Governor of Bank Indonesia. Agus Martowardojo is former the Finance Minister of Republic of Indonesia and CEO state-owned lender PT Bank Mandiri (Persero) Tbk. He was sworn by the president Susilo "SBY" Bambang Yudhoyono as the Governor of Bank Indonesia to replace Darmin Nasution. At present, the Governor of Bank Indonesia is assisted by 1 Senior Deputy Governor chaired by Mirza Adityaswara, and 4 Deputy Governors, namely Perry Warjiyo, Ronald Waas, Hendar, and Erwin Rijanto. Maximum age of 35 years old on 1 Februari 2017. Min. holds Bachelor Degree/S1 or equivalent in major Economics, Statistics, Mathematics, Engineering with GPA min. 3.00 within 4.00 scales. The candidate with prior experience as Economics Analyst or Economic Researcher is preferred. Expertise with macro and microeconomics. Good understanding of basic statistics. Familiar with statistics program (i.e Eviews, SOSS, Stata). Familiar with visual communication design (graphic design). Not being in a bond or willing to release a bond with other institutions when appointed as employee at Bank Indonesia. Never dishonorably discharged as an employee of the company / agency / institution anywhere. Never and / or not being in litigation or involved in legal proceedings. JobsCDC.com now available on android device. Download now on Google Play here. Please be aware of recruitment fraud. The entire stage of this selection process is free of charge. 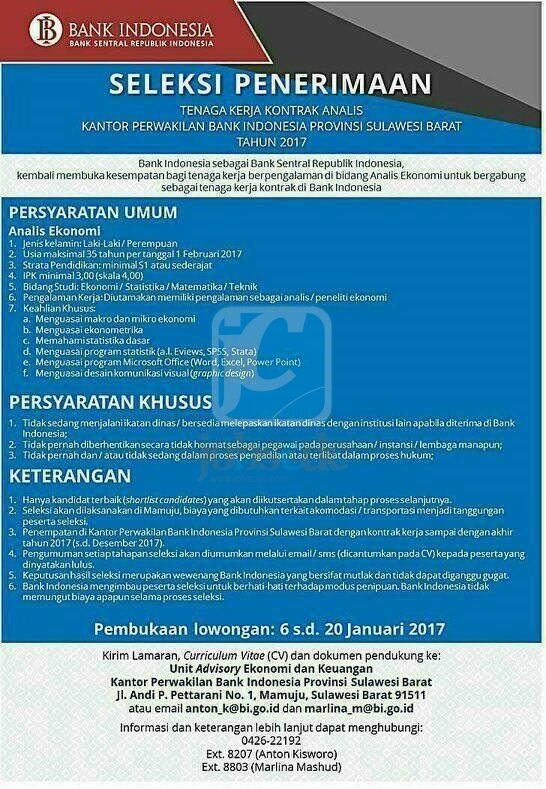 Bank Indonesia - Recruitment Economic Analyst Bank Indonesia January 2017 will never ask for fees or upfront payments for any purposes during the recruitment process such as transportation and accommodation.